The Korean War started in June 1950, and the Korean Cultural Centre has selected the War as the theme for the two films to be screened there this month. The first, on 12 June, is Taegukgi (태극기 휘날리며, also known as Brotherhood, or even Brotherhood of War), by Kang Je gyu (2004), while later in the month on 26 June will be Welcome to Dongmakgol, (웰컴 투 동막골) directed by Park Kwang-hyeon (2005). The two films could not be more different, but in their way are both a strong contrast to films about the Korean war made in the recent past. From the late 50s through to the 70s, to generalise probably rather too much, South Korean films about the war were action-oriented with a and left no room for doubt as to who the good guys were. Directors who took a more nuanced approach could end up in trouble: Director Lee Man Hee was arrested in 1965 for portraying communists in too favourable a light in Seven Women Prisoners, which served as a warning to others to toe the party line. From the 1980s, films began to explore other aspects of the conflict, its background and its aftermath. In the 1990s, Im Kwon Taek looked at the pre-war struggles in Taebaek Mountains (1994), while others examined the post-war relations with US troops (Kim Ki-duk, Address Unknown, 2001; Lee Kwang-mo, Spring in my home town, 1998). Taegugki is a dramatic switch to confronting the horrors of the war itself, focusing on the impact of the war on two brothers (Jang Dong-gun and Won Bin). Synopsis: Jin-tae shines shoes in order to save money to send his younger brother Jin-suk to university. Their mother runs a noodle shop, wishing the best for her two sons even though things have been tough since her husband has passed away. Sending Jin-suk to university has become the shining light in their everyday routine. At the start of the Korean War (25th June 1950), Jin-suk is unwillingly conscripted into the war. Jin-tae joins the war to save his brother and send him back home. Without money or influence, the only hope to save his brother is for Jin-tae to enlist in suicidal missions in order to earn the Medal of Honor. The medal will guarantee Jin-suk’s release. Jin-suk fails to understand his brother’s actions and misinterprets them as a dangerous mix of patriotism and obsession with fame and glory. It is only at the fatal end that Jin-suk realizes the truth of his brother’s sacrifice. We are subjected to a relentless portrayal of the brutality of the fighting and the impossibility of the situation that non-combatabts found themselves in when their town was taken over by one army or the other. Not for the faint-hearted, this film is interesting for its shift from a black and white portrayal of North / South relations to shades of grey, and also (as is required by the film’s message) for its focus on solely the Korean participants in the war. The film will be introduced by a British veteran of the Korean War, who will give his own perspective on the movie. Much more light-hearted, but similar in its shades of grey in its depiction of North / South relations in the middle of the war itself, is Welcome to Dongmakgol, in which a small number of soldiers from both sides – including one US airman – happen to end up in a mysterious village which seems to have been forgotten by time – and by the war. Synopsis: During the Korean War, soldiers from the US, North and South Korea come to a peaceful village, Dongmakgol. At first, they confront each other but soon, they start to mix with the villagers. But now the time has come when they must carry out their duties. The enemies are able to work together to save what seems more important than their loyalties to their own sides, and seek to defend the ancient village from the destructive forces coming from outside. 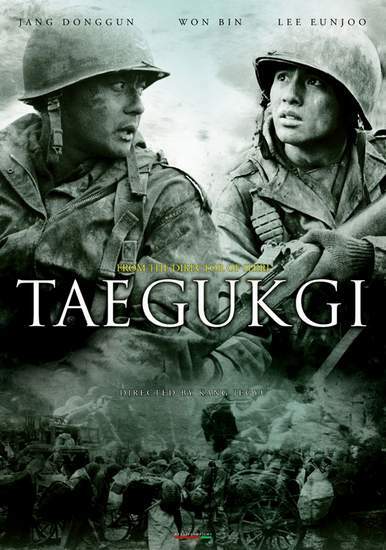 Taegukgi screens at 7pm on 12 June, and will be introduced by a British Korean War veteran. Welcome to Dongmakgol screens at 7pm on 26 June. Pre-registration for both is required by contacting the KCC in the normal way.